A writing experience as close to a fountain pen's as humanly possible. A non-metal barrel. I just dislike the cold, slippery touch of a metal writing instrument. A high quality look & feel, with a bit of elan thrown in. With that in mind, I've picked up a Retro51 Tornado, in Bocote hardwood. The Bocote was part of their 'deluxe' range till recently. Although now discontinued, it can still be sourced quite readily online. So! Onward to the review. I was lucky in that I got exactly what I wanted, a dark Bocote with plenty of interesting lines and eyes. It's a great finish that contrasts with the bright metalwork in a pleasing way. Being made of wood, there's a lot of natural variability between examples (more on that below); I've seen photos of other Bocote Tornados that were were plainer and much lighter. With the same bright metalwork, they sail a bit too close to kit-pen island for my tastes. I figured natural light would best represent the colour of the Bocote wood in an accurate way, so charged the camera, laced up the Karrimors, and had a tramp about the great outdoors. The shiny metal accents are a) very shiny and b) a pain to photograph. I like the gentle taper to the barrel, and the proportions are fairly pleasing. What do you think? The little cutout window in the clip is a neat touch; the metal knock is defined by a lip at either end. 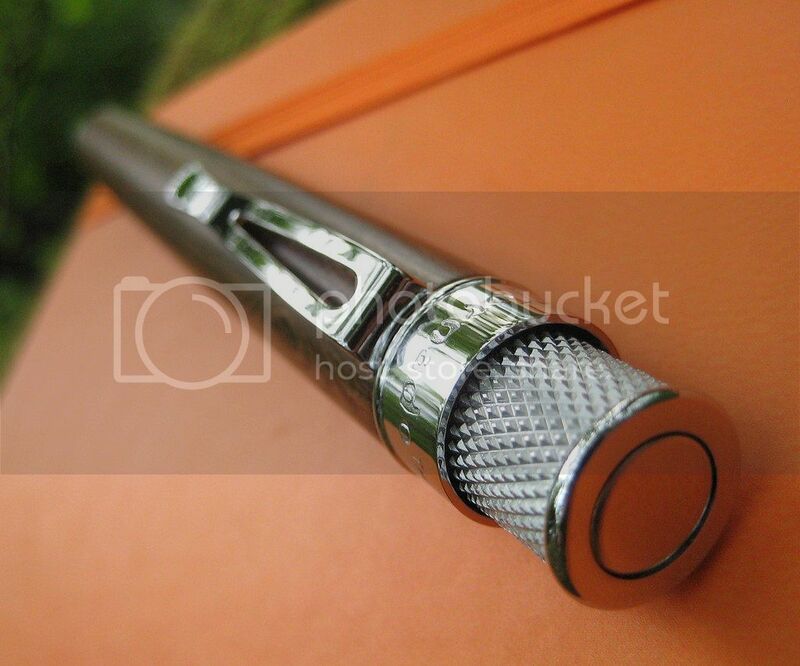 Something that's not obvious in vendor photographs is the style of the end finial; it's a blank metal circle on this model, matching the mirror finish of the clip. Mirror finish on the clip and knock finial, matte steel on the knurling. Bocote, of course, is an exotic Central and Southern American hardwood. It has a good natural lustre, and the grain patterning can be quite striking, particularly on flatsawn areas. It’s not uncommon to see many “eyes” and other figuring in Bocote: though unlike knots, they do not seem to present any special challenges in machining. Did that sound authoritative? It ought to, being plagia-pasted straight from The Wood Database. 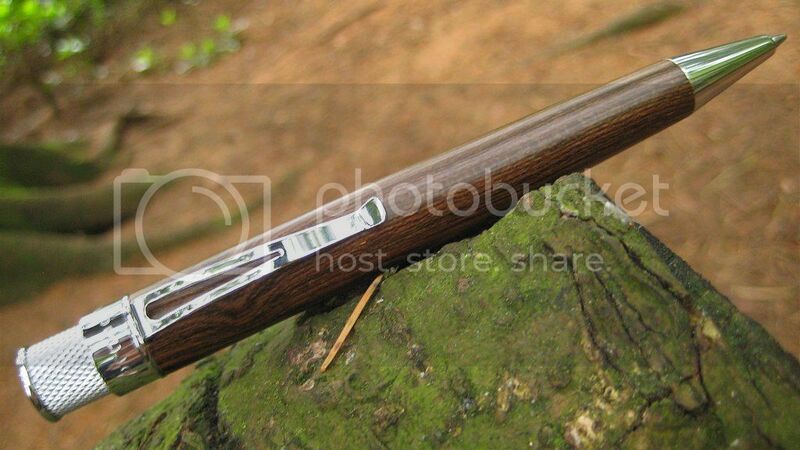 I have to admit I'd never heard of Bocote wood till noticing this pen for sale. I just saw this finish and found it more interesting and quirky than the "Goncalo" version, which was in production at the same time. 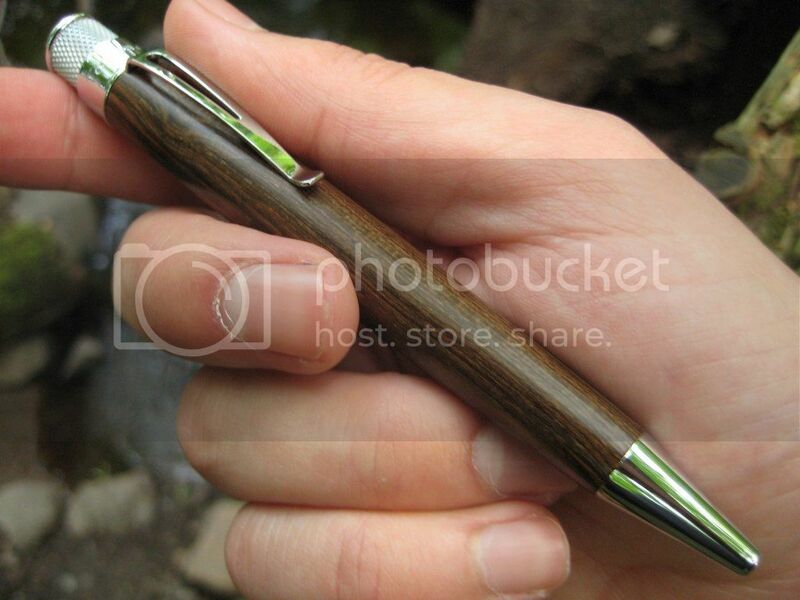 As well as looking good, the Bocote Tornado offers a great tactile experience. snag-free & very easy to use. The promise of an interesting,quirky look was certainly fulfilled. "With its striking, zebra-like contrasts, and bold figuring, Bocote can be a very eye-catching wood". I'd agree with that sentiment (thanks once again, lucidly articulate fellows @ The Wood Database). It's double-plus good, I've really no buyer's remorse in the aesthetics department. it kind of looks like a grumpy Jabba the Hutt is staring back. Very good, overall, nothing about the Tornado feels flimsy in hand. There's no side-to-side play in the clip, which is attached securely. All external parts fit flush, and the knurling on the twist action knock is deeply cut. On closer examination, a few features really stand out for special comment. The twist action "knock" turns smoothly, with a little mechanical resistance behind it, like a well weighted steering wheel. It engages with a positive action at the very end of its travel too - it feels as if something within is passing over a cam. Peering up the empty barrel with a torch, at least some of the internal knock parts look to be made of sturdy brass, which is reassuring! to accommodate the clip. The finial engraving is a curious design. A highlight has to be the Bocote hardwood itself. I've read that the hardwood finishes run a little thicker than the standard laquered steel models, but apart from this one minor concession (for my hand, more of a bonus) the material has been seamlessly incorporated into the standard Tornado design. It looks cohesive, not this year's take on an old concept. Where I'd expect the use of wood to pose a manufacturing challenge, I've been pleasantly surprised - look at the precision with which the clip slot has been cut in the photo above. Approximately half of the wooden barrel's length appears to be internally sleeved for strength, including the area put under pressure by the open end of the clip. 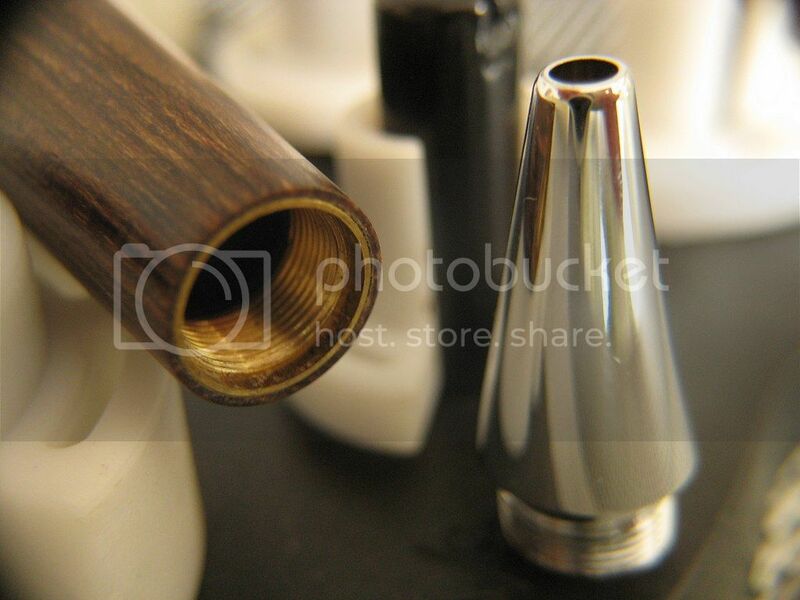 Additionally, the metal nose cone screws into a brass bush, rather than directly into the wood itself. A brass bush strengthens the end of the hardwood barrel. There are a couple of build quality issues. The worst of a mild pair are the minor manufacturing marks on opposite sides of the barrel, perpendicular to the wood grain, and running the length of the barrel. In a perfect world, these manufacturing marks would be polished out. The marks are too subtle to mar the pen's looks in any meaningful way - you'd have to look hard to find them in most lighting conditions. The photo above was taken in natural light, and shows how indistinct they are. Arrows highlight the most prominent. Another minor annoyance is the slight play between the end of the refill and its nosecone, manifesting in an occasional clicky/tappety noise as the point is lifted on & off the page. Typically, this has been apparent only when using a low writing angle. I'm not sure where the blame lies for this. Perhaps the tolerance between the refill and the nosecone opening could be tighter. Perhaps it is left loose intentionally; I have read the Tornado can use Parker style refills too. I do suspect the Tornado's spring, which is a bit crudely made compared to my YSL rollerball's (also twist activated and taking the same short Schmidt refills). There's less effort made to make the end coils sit straight for example,and the YSL spring makes better use of the refill's collar. Depending on which way round I fit the spring, I can occasionally hear it squirm against the nosecone as the point is extended or contracted. Personally speaking, these are very minor issues that don't add up to much disappointment, there is far too much the manufacturer got very right! I'm happy with the care evidenced in both the design and execution of the Bocote Tornado. I'm mostly a fountain pen guy, I know much less about rollerballs, gel pens, and such. I do understand that non-fountain pens write as well as their refill, so a few words on these. The Tornado uses rebranded Schmidt rollerball refills, which have long stuck in my mind as offering a near-fountain pen writing experience, being very smooth, with little drag, low viscosity, and allowing a shallower, fountain pen/pencilesque grip angle than a ballpoint will. The pen body is made in Taiwan, and the refill in Germany. It's been a couple of years since I last used a Schmidt rollerball refill (the fine P8126, in a chrome Yves Saint Laurent pen). Writing with the Tornado's medium P8127 picked up where the P8126 left off; it really offers an outstandingly smooth and consistent writing experience. These are smashing refills; they starts first time every time, despite the unsealed retractable roller, and ink flow is generous, yet composed. While the low viscosity ink takes a few seconds to dry on the page, as a fountain pen user it's a familiar tradeoff I'm happy to accept. Yes sir, a joy to use - for as long as they last! The sponge tube within is 5.5cm long. The liquid nature that makes the ink write so agreeably also makes for a fair amount of evaporative loss - note the "1 year cap off time" marking in the photo above. I've never found replacements on the high street, and in the past, actually ordered them in from overseas (they're worth the trouble). Of all the current online suppliers, Cult Pens deserves a mention, as a domestic UK supplier allowing you to buy them individually. 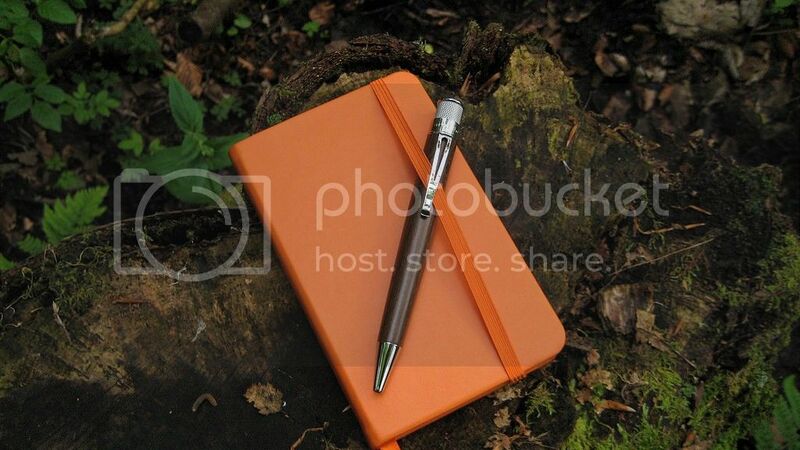 Leisurely notetaking with the hardwood Bocote Tornado in the great outdoors, its natural environment. Except I had to splice in some extra background noise I recorded, due to this clip's inexplicable silence. And I'm awkwardly failing to hold the notebook flat with one knee, as my other hand's holding the smartphone. It's all a sickening, cynical artifice. As a housing for the super Schmidt refill, I consider the wood-barreled Tornado better suited than the polished chrome YSL. The barrel taper is very shallow, and even at its end, the 0.9 cm section diameter allows a relaxed grip a habitual fountain pen user can appreciate. The Bocote hardwood is warm to the touch, pleasantly tactile, and lends the hand good control over the smooth rollerball tip. Although a full size pen, the Tornado is handy enough. Here it is with an A6 notebook for context. I'm a big fan of the clip. Its ski-jump shape is supremely functional, helping it fasten to pocket or page without snagging (well...most times), nor the need to prise it up. The end has a fairly wide footprint too. 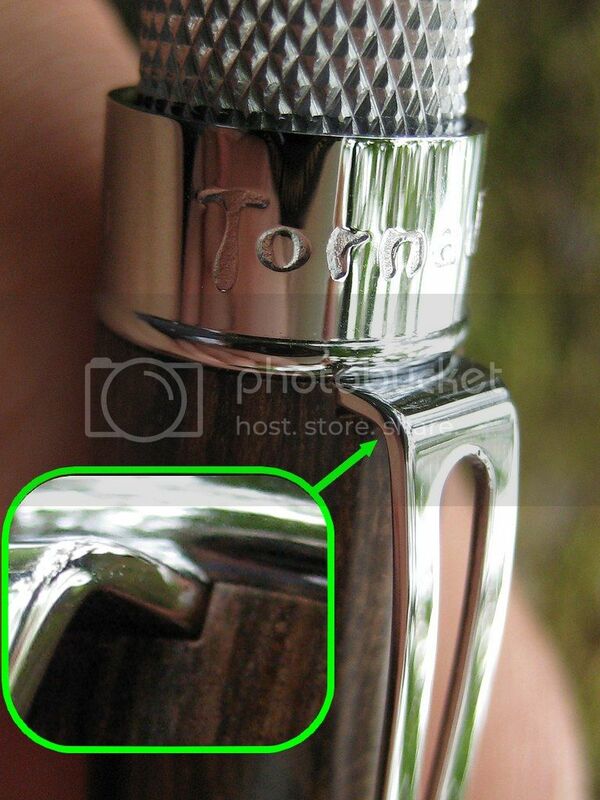 Mentioned earlier, the twist action "knock" is deeply knurled for a good grip in use. Additionally, each nodule is a tiny flat topped pyramid rather than a spike, so they don't dig into your skin. The clip does its job well enough. I did a little asking around on the FPGeeks forum before purchase, and one of the opinions put forward was the Tornado can be a little back heavy. I'd agree - it hasn't been enough of a bother to irritate much while writing, but when typing, pen in hand ready to scribble down ideas or asides (my mind is all over the place like that), I do have to let the barrel rest on my thumb to stop it slipping. Better balanced pens like the Parker 51 will happily stay nestled in the purlicue as I bash away at the keys. There's no cap, which is convenient. 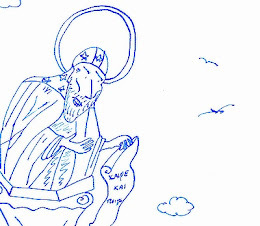 Extending and retracting the point does require both hands, though. All Tornado rollerballs are now solely supplied with a black, medium refill. Even the Deluxe range. This is a bit of a shame, as I would have gone for a blue cartridge given the choice. The packages are sealed, so you won't actually see the pen you're buying till you've bought it, whether in store or online. This is obviously less of a nuisance with the laquered metal models, but if you're looking for the individuality of a hardwood Deluxe model, prepare to be strangers till you rip off the cellophane! Going by a photo Retro51 sent me, there's a 2 in 3 chance of receiving a dark Bocote. I liked those odds and am glad I took a chance. Mine was a very specific circumstance, seeing as the majority of the Tornado range are made from very consistent materials, so I appreciated the creative help I was given to get around the problem. The packaging, in all other respects, is excellent, comprising of soft foam & hard cardboard to protect the pen in transit. It's also small enough to easily fit through a standard letterbox, and the presentation has a unique style. On balance, this one's a definite "Yay" ! that its discovery might shed light on my fate. A very useful and thorough review! Ha! Not sure if this is working today or not, but you're full up on your message box at FPN and don't seem to have been to FPGeeks - you've got at least one message there, hope life is just too wonderful for online time!